Blog — Eat a Duck I Must! Hello Friends of Eat a Duck I Must! You may have noticed that we've been rather quiet in our little corner of the interwebs. If you're actually reading this, then we're just amazed that you've made it back here! ;) It's been a little busy here, to say the very least. While we kept this piece of information quiet, we're now happy to tell you that five short months ago, we welcomed baby duck #2 to the family. Needless to say, life has been quite hectic and sleepless as we adjusted to having two children well under the age of 2. Yikes! But it's also been filled with so much more joy and happiness than we could have ever imagined. I am so incredibly thrilled to tell you about my latest project, Gus on the Go. For a good part of this past year, my software partner and I have been working hard to put together a language learning app for young children. (Yep, that meant I was working nonstop on this right through the end of my pregnancy and straight through the sleepless months after baby duck #2 was born). We had been kicking around the idea of working together on an app and the idea for Gus on the Go came about quite naturally. Language is no doubt a huge part of my life as Jared and I both speak Cantonese (though admittedly my Cantonese is atrocious) and a smidge of Mandarin. I always knew that I would do my best to impart some Cantonese to my kids. So after a little urging from my favorite neighbor (you know who you are! ), my partner and I set off on a language adventure and it's been a blast nonstop! Let me take you through a tour of Gus on the Go. We created a little owl and named his Gus. This name is actually quite personal to me because we used to call baby duck #1 Gus Gus when he was still in utero. The name stuck with us as we continued to develop this app and thus Gus the owl was born. We also thought it was really important to create an app without text in English. We wanted to create an environment that felt language immersive with an intuitive interface that did not require instructions. 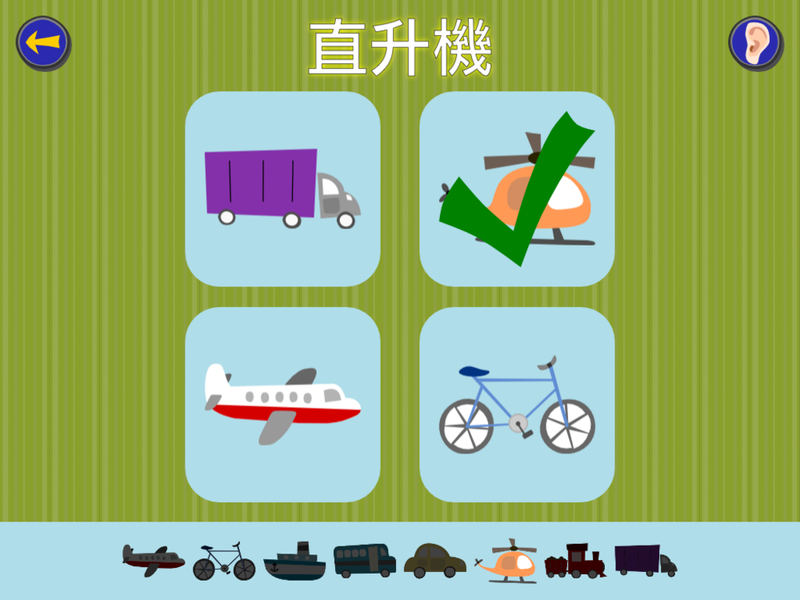 Tapping into to each city icon takes you to a little city scene with 2-3 vocabulary lessons grouped by the following themes: animals, food, transportation, clothes, parts of the body, shapes, colors and numbers. The more lessons and lesson reviews you complete, the more fun vocabulary games you unlock! Every vocabulary lesson has a fun interactive component. One of the first lessons I designed was the transportation scene. Swiping the screen spins the wheel of transportation. It seems like such a simple concept but it keeps baby duck #1 amused for quite a long time. Once the wheel stops spinning, the item at the top pops up with the word and a native speaker says the word at a slower pace. Another favorite lesson of mine is the number lesson. While this app isn't teaching kids how to count, I reused animal graphics from previous lessons to illustrate each number. Swiping and tapping helps you go forwards and backwards in the number lesson. .
After each interactive lesson, you are presented with a short review. If you tap the wrong item, the correct correct one is highlighted and the audio is replayed to help reinforce the correct audio and graphic pairing. But the most exciting part is that once you've completed the review, it unlocks more vocabulary lessons and games! Designing the vocabulary games was also an extremely fun process for us. We just asked our 5 year old inner selves what we would want to play and we ended up with 6 unique games. Each game incorporates words from previous lessons to help reinforce words you've learned in the past. We even included a trophy room to track achievements on all of the games! Check out our video demo of Gus on the Go. I've found that Gus on the Go works for a large range of ages, though typically we've been recommending it for kids aged 2-6. At a year and a half, baby duck #1 uses it to learn Cantonese as his primary language but I've also had kids up to 7 years old enthralled and challenged when using the app to learn a new foreign language. Gus on the Go is currently available on the App store in Spanish, German, Russian, Hebrew and Korean with many more languages to come. And as of today, Gus on the Go: Cantonese is now available! I can't truly express to you what this meant to me, but let me try to paint a picture. At the exact time my partner and I put together the beta version of Gus on the Go: Cantonese, baby duck #1 had just been starting to repeat a few words and building his mini vocabulary. I sat down with baby duck and my iPad and I nearly fell to the floor when I heard him repeat the word for "oval" which is not an easy word at all! Without exaggerating, my heart swelled to a new fullness. This was my Joy Luck Club moment. That cheesy movie intro with the feather falling from the sky. (Am I the only one that knows this reference??) I could not have scripted a better moment as I was almost moved to tears. All of the blood, sweat and tears I had put into this app came to a head right then and there. It was truly worth all of that effort for that moment and for the beginning of their Cantonese language learning process. I hugged baby duck a little tighter, looked at Jared and said, "This is exactly what I wanted for the boys." I told my partner the next day, "We're doing a good thing here". So here it is. To my beautiful baby ducks, Gus on the Go: Cantonese is for you. To our readers: Please help support Gus on the Go by liking our facebook page or downloading an app! And really, thanks for reading! !